Administrators in charge of a historic Leicestershire business have said they are optimistic about its future. Taylors, Eayre and Smith bell foundry on Freehold Street, Loughborough, was put up for sale last month due to a falling order book. 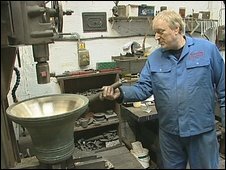 The foundry has been in the town since 1839 and has cast bells worldwide. Despite half the 26 workers being made redundant, the administrators said there had been a lot of interest and bids were being assessed. The firm, which traces its history back to the 14th Century, cast the largest bell in the UK - the Great Paul at St Paul's Cathedral in London - in 1881. Loughborough East county councillor Jewel Miah said hopes were high for a solution. He said: "I think (the administrators) will take a week to mull over the bids that do come in and hopefully at the end of the process we will have a solid bid in there."